Listed below are doughnuts demonstrated in The Advanced Doughnut Training Course. Open-Faced Cherry And Apple Turnover Doughnuts. Also Shown Are Pull-A-Part Mini Turnovers. Donuts are the second most profitable food item in the nation, second only to the potato! The cost to prepare and finish a donut is approximately 12 cents! The doughnut business is one of those rare businesses with a universal customer base. When made by scratch utilizing the copper kettle YOUR customers will feel as if transported back in time and discover decadent perfection. A melt in your mouth, light as air doughnut guaranteed to distinguish your business and please repeat customers for years to come. Take the competition by surprise when you implement a decadent doughnut line customers will seek every day, to start their day. Honestly, the coffee/donut shop business is brutal with stiff competition competing for your customers. New barista businesses are opening up nearly every day. Even the all mighty Starbucks realizes this and now offers cake doughnuts daily from Topot doughnuts located in Seattle Washington. I believe we can AGREE that is critical to have a competitive edge in business? A product only your business offers. A product customers will seek every day - to start their day. We both recognize today’s savvy customers want ambiance CONNECTED TO YOUR BUSINESS and want to feel as SPECIAL as the products and drinks you offer. It only makes sense to offer authentic products that defines a business as a place to relax and enjoy a cup of Joe. The French doughnut line will achieve just that! This is what will distinguish your business from the rest! The French doughnut will complement any food, coffee and drink business seeking to improve overall sales and create a buzz and coolness factor associated with doughnuts and making highly profitable French doughnuts utilizing the copper kettle... Well, is just cool to watch. Imagine for a moment... the buzz created when your customers rave about watching the art of the French doughnut being prepared in multiple varieties. Furthermore, you will not only attract new customers but instill a sense of tradition and pride using this time honored recipe that complements your premium coffee line. I learned how-to make French doughnuts by scratch in my uncle Charles bakery 25 years ago, and Charles learned the recipe 25+ years ago from Mel Bainbridge of doughnut world in San Francisco, and Mel learned the recipe from old time bakers of yesteryear. You will quickly learn how-to make the traditional French doughnut by scratch utilizing the copper kettle, (I also provide complete instructions to make French Doughnuts in the home kitchen). Fire up the copper kettle to a rolling boil. Add master and inclusion ingredients that we cook into a paste for a base. And finally, doughnut equipment training. We then deposit, fry, decorate and present a decadent doughnut line for our customers. I will be there every step of the way starting with raw ingredients to displaying the French doughnuts for sale. I unlock the mystery of a trade secret and show you step-by-step how-to make French doughnuts by scratch and ASSIST you in creating a unique French doughnut-line to dramatically increase sales. #3. Comparing French doughnuts made by scratch to doughnut premixes is like comparing a classic Cadillac to a old pinto about to be junked. When it comes to doughnuts? Some people enjoy cake doughnuts and some people enjoy yeast doughnuts, but all, YOUR customers will love French doughnuts because "the donut" is light and airy much like yeast doughnuts but with the exterior texture of a cake doughnuts. You can bet that makes for one happy customer! I would not be an effective helper/consultant if I did not do my very best to ensure you a recipe for success, (“I really mean that!”). I know what it is to start a donut/coffee house and put real money on the line. I want you to have every OPPORTUNITY to be successful, and that is why, I am sharing the recipe with you today. Every day you wait to BUY the French doughnut making course. Your competitor is gaining momentum, and worst of all, gaining new customer loyalty. What you need to do, right now, today! Now is the time to put any anxiety aside when thinking about implementing this product. I will walk you through step-by-step as you join me in my donut shop. Do not delay and ORDER, today! 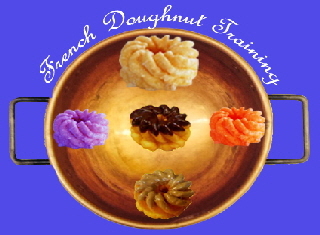 French Doughnut training video course via streaming video. CD-ROM containing the French Doughnut training course delivered to your door step in 7 business days. 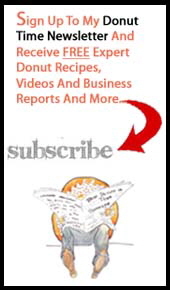 French Doughnut Recipe, Icings and recommended Equipment e-Book (PDF) Instant Access. No Risk Guarantee with ABSOLUTELY NO EXCLUSIONS for 90 days! If for ANY REASON you are not 100% satisfied with your ADVANCED DOUGHNUT TRAINING COURSE , I will promptly refund your money with NO QUESTIONS ASKED! This offer lasts for a full 90 days. NEW Video - I explain about making donut premixes in volume. NEW - Donut Machine and Donut Robot Master Cake Donut Recipe!! !